Respect film critics if you have invited them! How 'villain' Ajit changed his style for Amitabh Bachchan's Zanjeer! Let us start, in accordance with Indian priorities, with the music. RD Burman's soundtrack is terribly good, not only in itself but also because it seems to interact wonderfully with the script and the general ambiance intended by the director: psychedelic rock'n'roll coupled with lovely ballads set the tone to a movie which is, first of all, about society, education and their influence on the individual (a very common theme in Indian cinema). The music is also, in a very literal sense, the driving force of the movie. The first scene presents us with an idyllic family reunion in which all members sing a delightful song (Yaadon Ki Bharat) which is but a prelude to the massacre that follows. The three brothers see their parents being killed, run away and part; they grow up in very distinct social contexts and will be reunited only at the end of the movie, in a very emotional scene, when one of them sings the tune and thus discloses his origin. 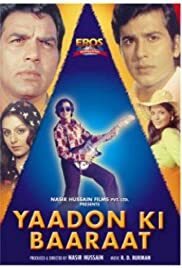 In the meantime, the fact that this same character sings and plays at a fancy hotel allows for the introduction of some of the best guitar-driven and experimental music Bollywood has ever heard. The movie focuses on the two other brothers. One of them is a thief and a bitter drunkard (with a good heart, of course, and a heroic nature), while the other one is some sort of a happy-go-lucky boy who just wants to get the best out of life. He falls in love with a beautiful, high-class Bombay girl, in a relationship that unsurprisingly raises some issues on class difference. Everything ends up in a happy tone, of course, leaving you with the desire to listen to those songs over and over again.